I was racing around like a mad thing yesterday, going into every op shop and photography shop looking for frames for an artwork that’s been commissioned and can I just say, if you want to see some bizarre artwork and weird photos, not to mention the boring long stitch works framed and then thrown out. But in the middle of all the weirdness was this. 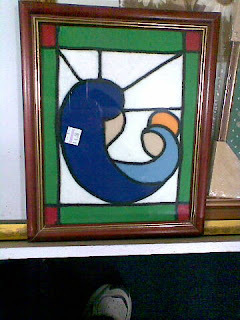 At first glance I thought it was stained glass in a frame, which at the next moment I figured was silly, because stained glass needs light behind it to illuminate the design, which if you framed it would obviously go dark. So curious, I pulled it out and had a closer look. It’s actually felt, and the black lines that make it look like stained glass, was black wool glued to the top. I thought it was a beautiful idea, and I’m going to utalise (read: knick) it. I’m not sure what for yet, but everything sinks in and comes back out when needed.